Rubber products, including tires, are subject to aging. Experts advise to change tires after the line of validity, even if they are not used. For most tires the expiration date is equal to 5-6 years from production date. Leading manufacturers offer a guarantee of 10 years on their products. 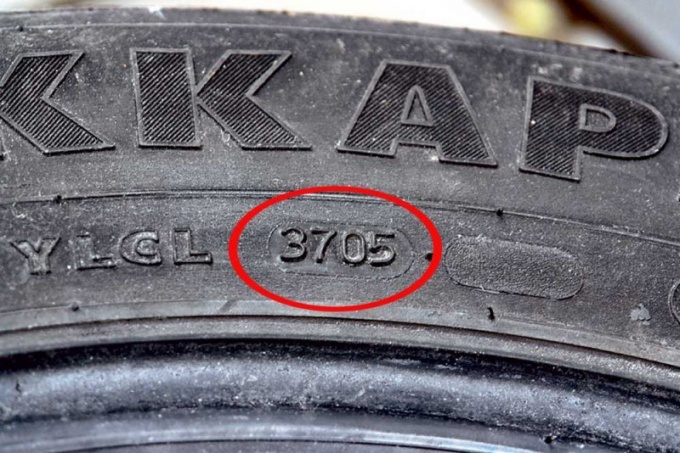 Determine the date of manufacture of the tyre according to its identification number. The difference of the identification numbers of the tires from the car identification number (VIN) and identification numbers of other consumer goods is that the serial number of the tyre contains information about the week and year of manufacture of a particular consignment. Please note that the identification number of the tires must begin with Latin letters DOT, followed by a code combination of the ten, eleven or twelve Latin letters and numbers, which carry information about the country-manufacturer, tire size, manufacturer's code, the week and year of manufacture of the product. According to the requirements of traffic safety the serial number of the established specimen shall be applied on all tires. To know the release date of tire manufactured after 2000 note the last four digits of the ID number. The first two digits indicate the week of manufacture, last two digits the year of manufacture. For example, if the identification number has the form DOT U6LLLMLR 0100, the product released in the first week of 2000. To determine the manufacture date of the tires produced prior to 2000 use a different method. The fact that the system identification numbers of the tires that were used until 2000, took into account the maximum service life of the tyre not more than 10 years. Therefore, the question of the week and year of manufacture were encrypted in the last three digits. The first two digits signifying the week of manufacture and the last digit is the year. For example, the identification number of the form DOT EJ3J DFM 519 means that the product released on the 51st week of the 9th year (meaning this decade).